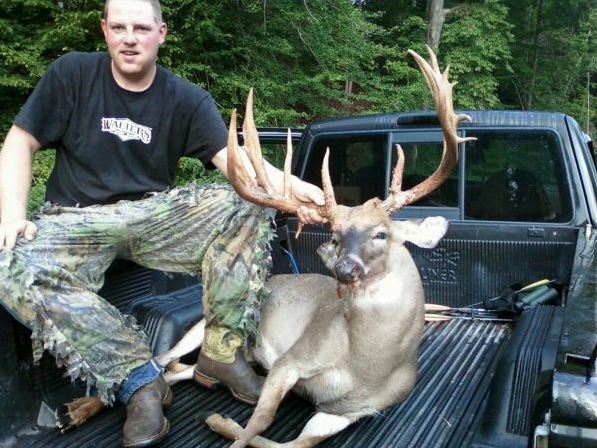 Steven Davis killed one of those bucks that drive hunters across the country to settle into deer stands in the Midwest. For there is where so many whitetail monarchs roam the woods and plains. Except instead of taking the deer in one of the heartland states of Iowa, Kansas or Illinois, Davis shot the nearly 190″ buck on his family land in Davidson County, NC. That’s not a typo! According to an article on North Carolina Sportsman Davis had trail cam pictures of the giant and watched him on the hoof for four days before getting a crossbow bolt into him on Sept. 18. The buck is likely headed to the top of the list of bucks killed with archery gear in North Carolina. He is a remarkable animal regardless of the state. In addition to seeing the deer, he even had the opportunity to watch the buck shed his velvet. What strikes me about this amazing opportunity for Davis is not only that he was able to shoot the deer, but how he enjoyed the excitement that came with actually pursuing him over several days. I’m not sure I would have been able to sleep during that time! Also interesting is that several neighbors had photos of this buck dating back several years and as far away as five miles from where Davis shot the buck! What a great legend of a deer. Congrats to Davis, who is a full-time firefighter for the city of Winston-Salem.